Bob Pollin & Michael Lighty hold that Medicare for All does not have into include private insurers like Medicare does today. This entry was posted in medicare supplement and tagged alternative news, Bob Pollin, Breaking news, California Nurse Assoc, congress, Daily News, Democrats, headline news, Health Insurance, Independent News, international news, Local News, Marc Steiner, medicare advantage, Medicare for All, Michael Lighty, News and Politics, political News, real news, realnews, single payer, The Real News, therealnews, UMass Amherst, us news. Bookmark the permalink. I bet most private insurers don’t want that and they are the ones contributing to election campaigns. I’m not a private insurer but I don’t want that either. If the govt runs my health then I have to count on govt being efficient and effective so that I get good care. We all know that isn’t the case. Plus, sooner or later the govt will want to dictate how I should behave so as to lower “health costs” for the country. In short, public health means a loss of individual liberty to decide how I should live my life. +Felipe A I can see your point about the government being effective. Looking at the current state of government, it is anything but. If the government runs healthcare what happens when government is shut down. You can argue any kind of law or government is about losing individual liberty. I am sure a lot of inmates would agree. But I doubt universal healthcare is that. +Felipe A In the US, if there was medicare for all, you would still have the option of buying private insurance. That is what people in France do. I have a friend who lives there. She bought private insurance for her sons due to some health issues. You would still have the choice to buy private insurance. +nathen morris People are up in arms about paying taxes for healthcare they and their kids can access when needed – which will improve the general health of our country by leaps and bounds — but they are not up in arms with dumping endless tax money into a corrupt DOD. The Spentagone can “lose” trillions of dollars. No one says a word about the DOD being a corrupt drain on US taxpayers, which is what they are, a warmongering welfare state. Henrik Jensen is more to do with the type of capitalism that US inflicts on its people, Insurance industry is a powerful lobby. +nathen morris My comment was about how everyone does not want to confront the criminal graft and fraud going on with trillions of dollars of our tax money at the DOD. +Voices Lost and Found my comment is why will no one take responsibility for their health and instead go to the doctor who has no monetary incentive to care? Why won’t they confront that problem? 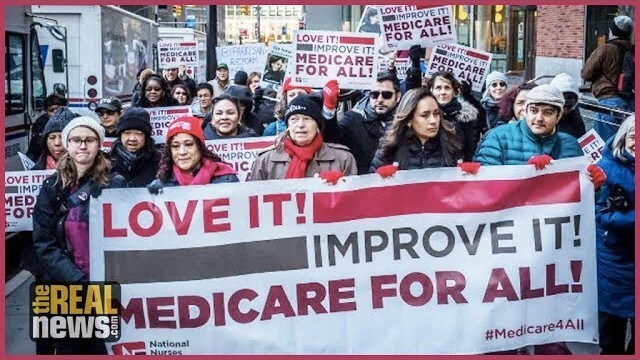 I’ve been on Medicare for ten years and love it but Bernie’s Medicare for all is much better and the best plan. +Sandy Well, it is the same. I think corporate money told democrats if you want our money then get rid of Sanders. I think Bernie’s plan is much more extensive all medical is covered but it includes dental & vision all are covered and it’s universal healthcare. Mary, there are many problems in Bernie’s plan. One of the biggest problems is that he leaves long term care to Medicaid. That means that you will need to use up all your resources before you will qualify for Medicaid and get long term care. Also, since States have to run balanced budgets year to year, if cuts are to be made or if a particular state is being run by conservatives, they will cut Medicaid services. I’ve been through 13 major surgeries since I was rear ended. It’s bankrupted me twice and might force me to seek medical asylum in another country. MedicareForAll would solve my problems. We really need to come into the 21st Century like most civilized countries and provide Medicare For All, single payer instead of for profit healthcare insurance. +Melanie SI couldn’t agree more. Unfortunately, these are things only every other industrialized nation could figure out. It’s just too hard for us here for some reason..I’m sure it doesn’t have anything to do with our system being corrupt and bought. Since I have been suffering from chronic immune problems due to improperly treated Lyme (although I went to the doctor with a tick bite and the tick) – I can understand why someone would go live in another country for medical reasons. Proper healthcare allows people to lead productive and meaningful lives. In the US, the insurance corporations have prevented people from doing just that, all across the country. They are just criminals at this point. I live near an enormous house that the CEO of a major insurance company built for his mistress to live in. It is the size of a university building and was never his main home. Why should our lives suffer while these pigs throw millions around in frivolity? Time for a BIG change. +Voices Lost and Found 100% correct. A systematic change. Unfortunately the US is overrun with ignorance. A perfect example of the definition of insanity. Where people continue to vote against there own future and well being. I don’t know how you wake them up but it is sure as hell time. IMO Trump is just a symptom but is indicative of how ignorant voters are. Both parties. Makes little difference. +Patrick van meter I agree with your assessment of the two parties at this point. One can see that the US people have good values at heart while their war mongering deep state cashocracy does not. The US is not a democratic republic – it is a undemocratic mafia owned by a foreign nation. +jbcomics i hate to admit it but your a 1000 % right. We are an undemocratic mafia – but the mob is in our own country. It won’t be fixed until we take responsibility for fixing it. The last I heard DC is part of the “occupied territories” ruled by the Zionists. +Andy M Do you know about the “shithole countries’ remark that Herr Drumpf made a while ago? ResistEvolve breaking news is that he’s now officially supporting putting a dictatorship in place in Venezuela and not recognising Maduro as the democratically elected leader that he is. I guess the bombs will be following and won’t stop until US corporations have control of their oil. He’s the worst warlord we’ve had in modern times, the only judgement value he has is profit. +Andy M True – And the “anti-communist” propaganda never mentions our enormous, bloated DOD with its droves of well paid civilian employees, its “lost” trillions of dollars, and its intelligence agencies that spy on our own people, etc. Medicare needs to be overhauled immediately to get rid of “Medicare Advantage” policies. How is it ever “less expensive” to insert private profit into any equation? It isn’t. If the Insurance industry has any brains at all, they’ll get on board with Universal Medicare before the country decides to eliminate all kinds of insurance whatsoever across the board. Or maybe they want to lose Auto, Life, and Property too. Wish I was currently paying 15% for healthcare.. We pay 700 per month for a young healthy family of 3. That’s a mortgage payment for a modest home. Here (Norway) 3.2% for Health Insurance, 4.6% for pension. J.L. Goodman – yes insurance is a scam, an investment in fear so they rob us blind. In USA the taxpayers have Medicare for all. For all Israelis. Corporations love private insurance because it gives them control over their employees. Insurers love private insurance because it allows them to steal money. There doesn’t seem to be any further benefit to health or people, quite the opposite. Single-payer healthcare is the way to go. I lived in Japan for 12 years & Japan has national health insurance that is based on the 70/30 ratio that most privatized companies here in the United States. The government covers 70 percent, however, there are NO deductibles, medical costs are kept low due to government regulations, no preexisting condition clauses & monthly payments are income-based, percentage payments. For example, we (my wife & I) made about ¥48 Mil (about 48k) a year & our monthly insurance payment (for a family of four) was about $280 a month & that was for FULL medical, dental & vision coverage. My wife & son spent 5 days in the hospital for his birth & aftercare. The total cost for the birthing, care & 5-day hospital was about 5k & after insurance paid we paid about 1.5k. Compare that to the United States where a (vaginal) BIRTHING ALONE costs between 19-23k & that is giving birth & getting out. The U.S. healthcare is a sociopathic system that doesn’t serve the purpose of a healthcare system, rather it serves as a means of exuberant profits for oligarchs. And what is Japanese debt? What is Japanese GDP growth? Why does SoftBank invest most of it’s money outside Japan, the Japanese youth should be innovating and working as now they have nothing to worry about. A system fueled by debt and/or high taxes does not work. It leads to loss of innovation and productivity. People work just not as productive. Remember, America got to where it is without single payer. Same goes for Japan, Sweden, Denmark, France , UK. These countries got to where they are right now without single payer system, with free markets. Now that these countries are establishing welfare states, they are running deficitsz, debt and the related problems. You think you can tax wealthy because all they want to do with their money is live an exuberant lifestyle? Think about in a risk reward manner. Why would you like to start a Business when you get to deal with ALL of the losses but you only get to keep say half of the profits. It just does not make any sense in the risk to reward equation to start a business or invest in a new business. Who will invest in new start-ups and new technologies when you allow rich go keep only a small share of their earnings? You think government is going to keep money aside for investing in start ups? No! They’ll spend all that money the moment they collect it on welfare. Human needs are unending, socialized medicine is one of it. This ensure that the economic pie gets smaller everyday and this paradise won’t last long. Nothing can be socialized, everything has to be earned. And You say the rich don’t deserve their money? Wages come from the rich, because they innovate. Now of course there are two kinds of rich, one type is like bill gates and Jeff bezos who get rich by innovation and making people’s life better. I don’t care if the person who invents a cure for cancer becomes a trillionaire, that person deserves it , and sure as hell a government would not be the one inventing a cure for cancer because they will be busy spending money on welfare checks. The other type of rich are the rich who have made it by misuse of the power of government, like say the healthcare insurance cartel, or the food suppliers cartel to government schools. These rich went to the local politicians, gave them bribes and got fat government contracts, or got protections from outside competition. These kind of rich , I don’t condone, they made everyone else miserable because they were hand in pocket with the government. So in the first case wages come from rich and in the second case wages come from the government. Bottom line: the rich need money to finance Innovation and because a government cannot do that as they spend every Penny on freebies. Japanese public debt stood at $10 trillion (200% of GDP) as compared to United States where it is (105% of GDP). Socialized Healthcare has created lost decades for all of the nations including Sweden and Denmark wherever it has been implemented. It is not viable thing economically and people pay for it by less innovation and lower growth. The economic pie keeps shrinking. Japan, France, UK, Sweden, Denmark all have fallen a victim as the innovation levels have taken a nosedive. They all need to import labour by way of immigration, not to increase population but because immigrants can only work in the private sector which is starved of skilled labour, so they import skilled labor to augment private industry while the citizens just work in the government and enjoy all the benefits from taxed money and innovation. American healthcare system is one of the worst because there is no choice and no competition. There used to be clinics in America at one point of time operated by a lone doctor and probably a front desk employee. These clinics you paid cash and you went home with a prescription in your hand. There was very little overhead and very cheap and easy to operate. Those clinics have now been priced out by the insurance and hospitals cartel by way of paying politicians to increase regulations. So bye bye to cheap affordable healthcare to all. Now you visit a doctor for so much as an minor infection, you pay for all of the overhead in a hospital. So insurance now is a requirement. There is limited choice, you can’t choose an insurance across state lines, and there’s loads of regulations, so the competition is very limited at best between two health insurance companies. So when you work in an health insurance industry, you notice that the executives are paid heavily, but they don’t do a whole lot of work. That’s how it is to work in an industry protected by government. You get paid a lot to do very little work. People know the problem is healthcare and the cartel but do you really think that government control of medicine will subdue this cartel? No! These cartel people are hand in hand with elected officials. What we should be fighting for is more competition which will break up this cartel. To thrash the protectionist policies that helps the cartel. More generic competition from China, relaxed regulations on insurance industry to allow newer entrants, relaxed norms for hospitals to allow a single doctor to establish his/her clinic so you get low cost medicine without paying for all the overhead. Relaxed norms for pharmacies which will break CVS- Walgreens duopoly. This is what we should be fighting for, not single payer system. It’s hard to understand but it is the problem. We have created an environment where rich can get richer by protectionism with government and not Innovation. Finally to the most irrelevant point, Americans living overseas pay only the difference in taxes between that of the country of residence and American taxes. If Japan taxes American citizen working in Japan at 20% and if USA charges 30% at the same income, then the American pays only the difference which is 10% and not the whole 30% . It was created during the civil war to tax Americans fleeing to Canada to avoid the conscription. It is random trivia but nonetheless important. I’m 74 & I can’t afford supplemental insurance. Medicaid has turned me down because I make $50 over limit per month. It is a constant struggle to survive. I can’t work because of some health issues. YES IT WILL REQUIRE MILLIONS OF US IN THE STREETS. This is greed of insurance companies vs health of people. Private insurance companies profits go up when they deny coverage. Why its this so difficult to grasp? Just do it right……a right, universally applied,. In a truly universal system the only question is how can we help. Absolutely don’t leave a single crack, or the crony capitalist will force capitalist ideals of supply demand, priorities, rationing…….nope doesn’t matter who you are, in any way shape or form, lifestyle, intelligents, it plays zero role. You live in a country where Bezos has a personal wealth of over 100 billion! AND he’s not willing to share it.